China-based GAC Motor unveiled the Entranze concept, a highly stylized van/crossover vehicle the company says is the “unlimited vision” of the company’s future products. The family values-inspired design is touted as the ultimate family adventure vehicle for all environments, road, outdoors and city. The vehicle features sliding doors and panoramic sunroof, and drop-opening rocker panels that double as seats. Inside, 2+2 seating with storage trolley slides between front and back seats. Aero interior design blends hard and soft surfaces, and is autonomous-ready. It features a living room environment with large viewing screen. Details include sustainable wood materials and fuzzy dice for good luck. The exterior also blends hard and soft surfaces, with glass doors, stealthy design cues and signature LED lighting. 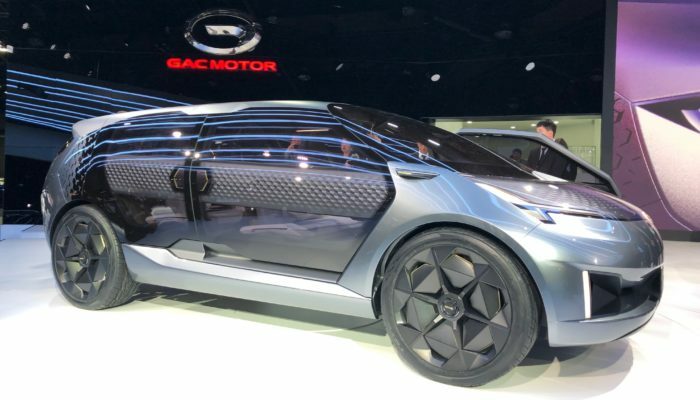 Yu Jun, president of GAC Motor and chair of GAC Energy, notes that 2019 marks the fifth year for the company at NAIAS, and announced the expanded development of R&D and design facilities in Los Angeles, Silicon Valley and the Detroit area.